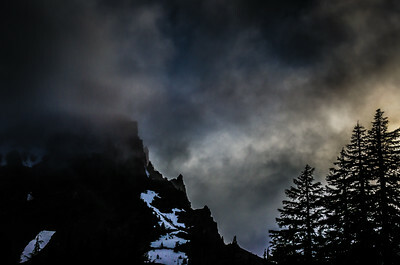 On the flanks of Mount Index, on the way to Bridal Veil Falls and Lake Serene, on a normal PNW kind of day, I saw this. 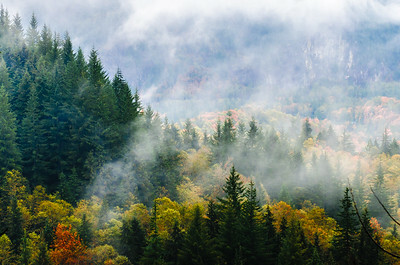 Fall in Washington. 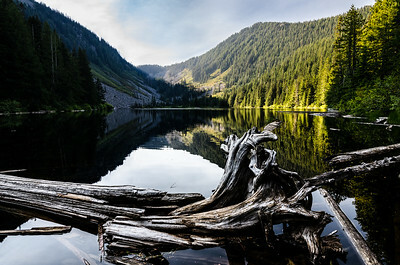 On a perfectly still afternoon, by the perfectly glassy Talapus Lake, relaxing after a perfectly PNW hike, these gnarly logs spoke to me. I had to stop and listen. You are a witness. 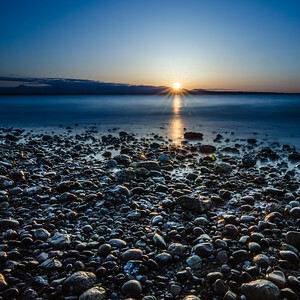 The rocky Carkeek Park beach was more interesting than the sunset. Well, I guess they complement each other. 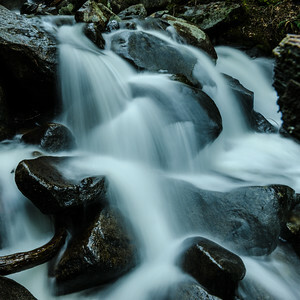 This is a long exposure using the Big Stopper. 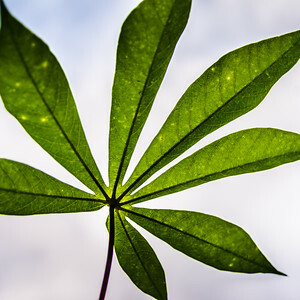 The cassava leaf is remarkably large. I try to accentuate the size in this down-under-looking-up shot. 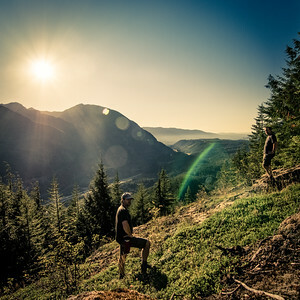 On the way up to Dirty Harry's Balcony, the woods suddenly opened up for a nice view down the Mountains to Sound valley. It was so nice I had to get two pictures of myself so that I wouldn't forget this moment. This is me in both poses and there is no photoshop involved, and this is not a double exposure. Any clues as to how I did this? Here's a hint: it's really cool, as in as cool as I.C.E. 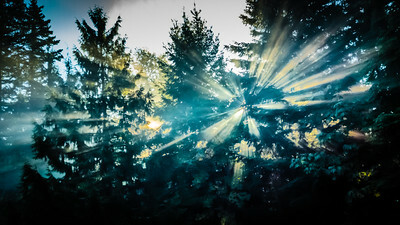 The sun breaks through the thick morning clouds over Bellevue, Washington. 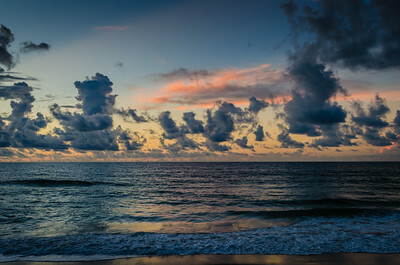 A traffic jam of clouds occurs off the coast of Wrightsville Beach as they shuffle along the wind lane, slowly morphing, toward the rising sun. Here's some white, gray and black for our gray, fall day in Seattle. 😁 Are these as delicious looking as the color version? When color is absent our minds find other associations to make. Delicious is probably not one of them with these berries in black and white. Perhaps the details of the berries themselves stands out more, or the way they are held apart by the containers. The insides of these berries seem so dark! Maybe they taste like chocolate...or charcoal! 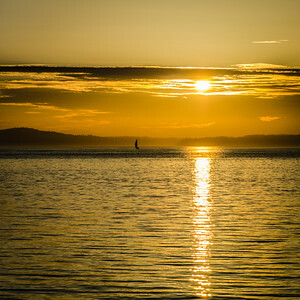 Zooming in on a Puget Sound sunset emphasizes the beautiful golden light that fills the frame. 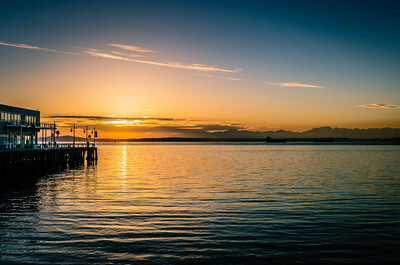 The silhouette of a sailboat is visible far out in the sound. I'd like to imagine what the folks in that boat are thinking. 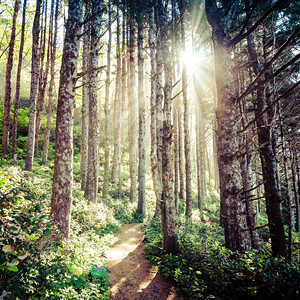 A bright and warm sunlight forces its way through the cool fog on this trail along the Oregon coast. 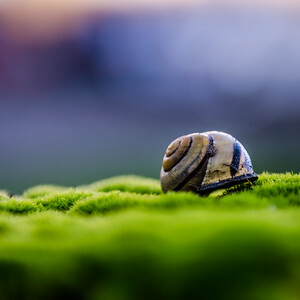 Late afternoon light and colors make a pretty background for this snails pace picture. A mossy fence post makes a nice, green comforter for this sleeping creature. 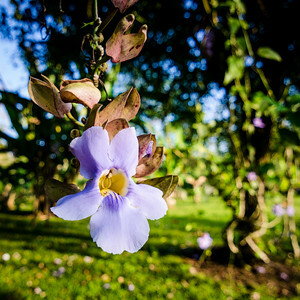 Early morning sunshine bathes the hanging flowers and invigorates the greens in this tropical moment in Panama. 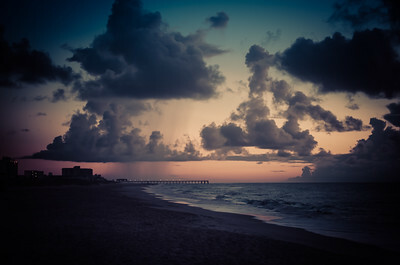 Far in the distance, the Johnny Mercer Pier extends out from the black silhouettes of the buldings toward the sunrise colors in this view down the beach at Wrightsville Beach, North Carolina. 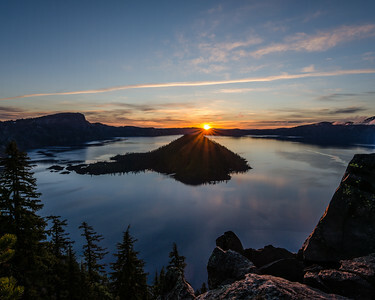 Thirty one minutes after 5:00 AM and the sun shoots its rays of life over the cold and still lake and island. 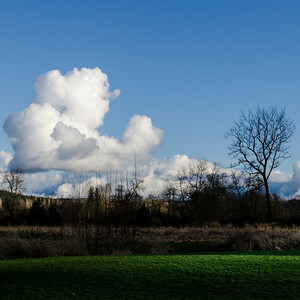 Some clouds float by as winter slowly escapes away at the Tolt-MacDonald Park. 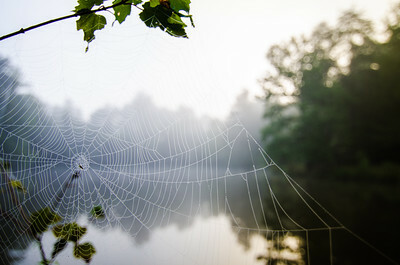 A spider's web holds the sky and water together after suffering the violence of a torrential downpour the night before. Thanks to this one little spider's work the world did not fall apart on this particular morning. 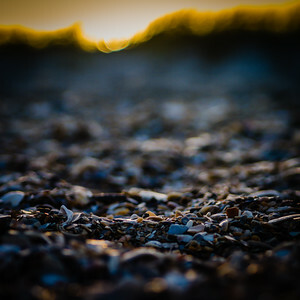 Set camera aperture, point camera at sand while facing sunset brightness. Push shutter button. Enjoy. 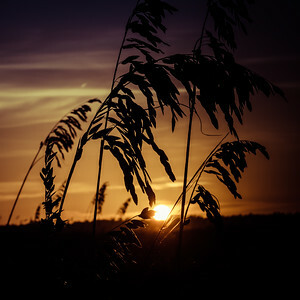 If you look in the wild sea oats, to the right and below the sun, you'll see a man taking a picture of the sunset. I didn't realize there was anyone there until after I downloaded my shots from the camera. 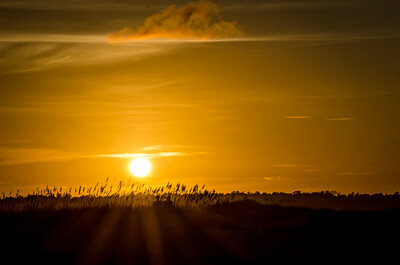 This is a September sunset shot on Wrightsville beach. A DeLorean DMC-12 shrieks down the tracks as it arrives from the the future. They came to fix a bolt that is rusting a little faster than the others on the Space Needle. That bolt causes a catastrophic collapse of the Needle in the year 2078 and kills Marty Jr's grandson. By fixing it now, all trouble is averted. Ok, in reality it is just a rather slow moving train passing by underneath the Amgen pedestrian bridge. 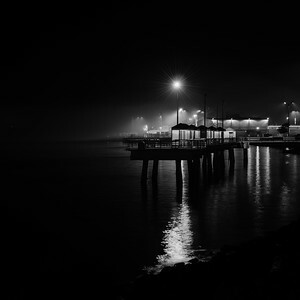 In this time exposure it seems just a bit more dramatic. An alien space ship, looking a lot like a three legged goose with its feathers plucked out, has touched down near the Seattle water front. It is clearly powered by a nuclear head. It is very still and stealthy and with its head looking like our sun the people standing nearby are lulled with a warm feeling and a false sense of security. 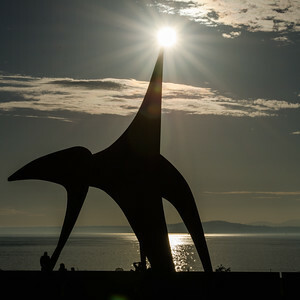 Actually this is Alexander Calder's "Eagle" in the Seattle Sculpture Park. Originally created in 1971 and brought to the park when it was built in 2007. 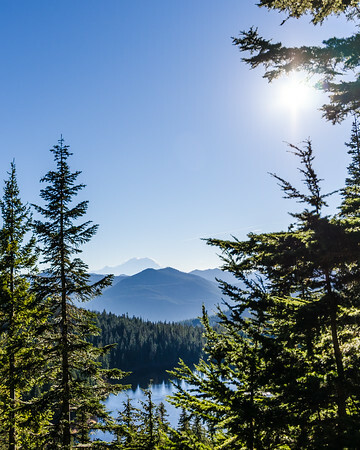 Well, the sun was right there and so was Mount Rainier and Olallie Lake down below. I had to make this work, because it was too beautiful to pass by and forget. 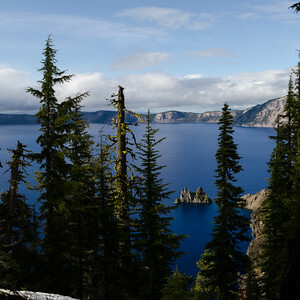 Tree tips and mountain peak tips poke up into the clouds at Sun Notch at Crater Lake. 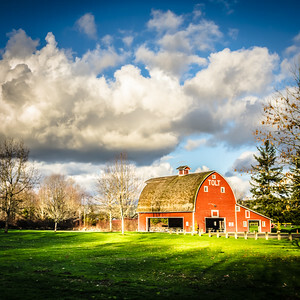 A very old and remodeled barn catches the late afternoon sun at the Tolt-MacDonald park. It was a beautiful day! I'm lying flat on my back under the center Minoru Yamasaki arch. The wide angle lens captures four of the other arches in a symmetrical manner. 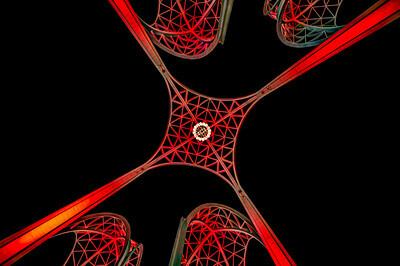 The red coloring is caused by colored lights that project up from each of the four supports of each arch. These arches are 100 feet tall (about 30.5 meters) and where build in 1962 for the Seattle World's Fair. Early morning after a heavy rain the night before. 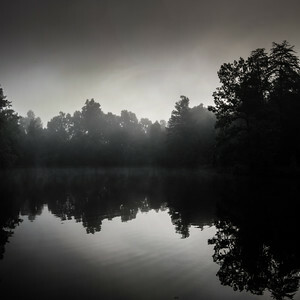 A thick mist is shrouding the sunrise but creating a nice mood for a photo. You can have one too! I've been enjoying the fruit of this picture all by myself, but then realized that wasn't nice. 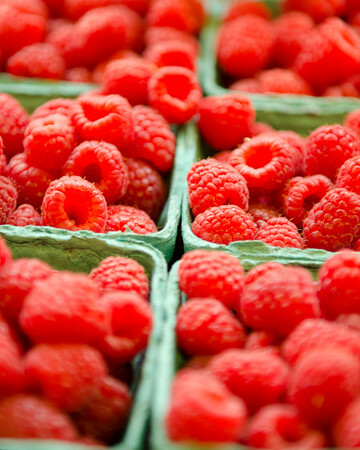 So please help yourself to some delicious red raspberries from Pike Place Market. 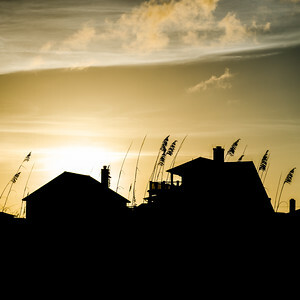 Homes along Wrightsville Beach in North Carolina share their silhouettes with the wild oats. The clouds were quite interesting at this moment as well; they almost look like a thick smoke. 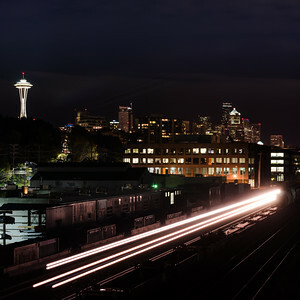 Train tracks and bright lights, Needles and Globes--this looks like the backside of Seattle; a view that probably only the local residents see from the West Thomas Street pedestrian and bicycle overpass. I do wish those super bright lights down there on the right were not there or at least not so powerful. This is a 30 second exposure at f/14 so some clouds do look like they are stretched out. 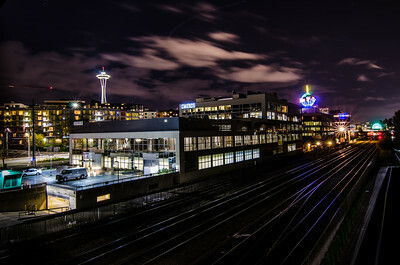 I do like the colors of the lights across the tracks, and I also like the look of bright, white, industrial lights shining through windows. 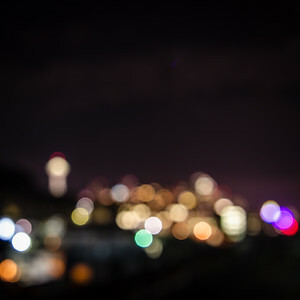 This is a view of Seattle from the Amgen pedestrian bridge. I am looking south. The space needle is the tallest light with a little bit of red on top. 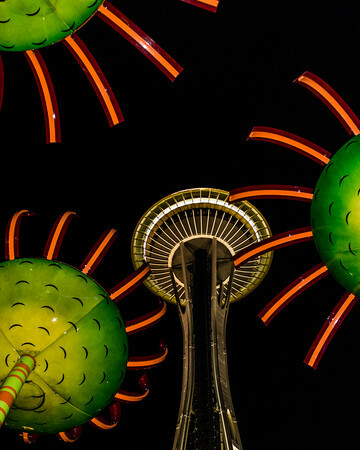 The Seattle PI's globe and the Seattle Big Wheel are the purple and red on the far right. Got it? Untouched colors are so blue! 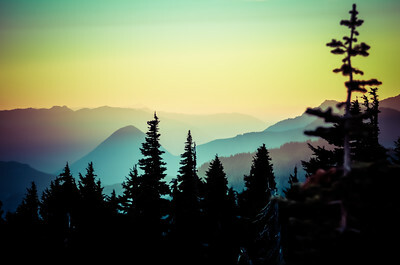 This is several shots stitched together to make a panorama shot. We were really thankful for the clearing on this side of the lake. 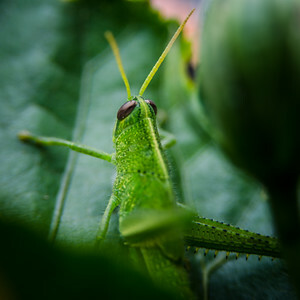 This grasshopper and I are eyeing each other but certainly with different intents. Any fast moves by either of us will probably make the other jump. I'm pretty sure this very neat sunburst effect was caused by smoke from fireplaces. There was a temperature inversion during the night and no wind in the morning so the smoke was hanging low among the trees. Took this shot with my smartphone, a Nokia 1520. 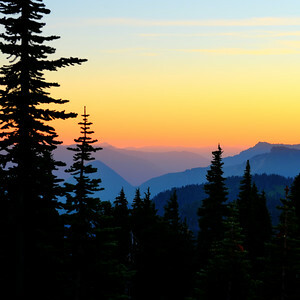 It takes a 5 MPixel jpg and a 16 MPixel dng raw image at the same time. 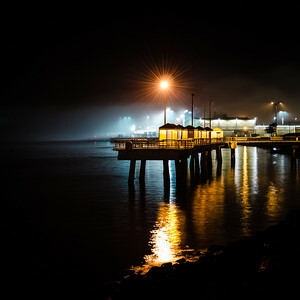 I processed the dng in LIghtroom for this shot. Tiny things to delight the eyes! 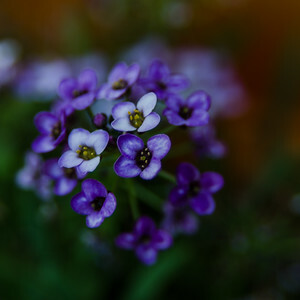 Tiny flowers can be packed full with beauty. Mnfpr grmp frgsh? Sorry, Mr. Squirrel. I can't understand you with that nut in your mouth. 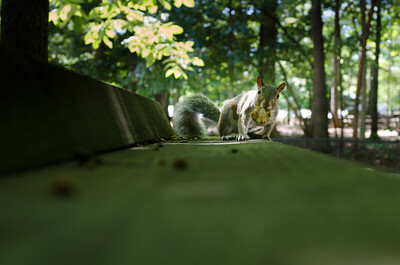 😉😉 A surprised, dining squirrel in North Carolina. 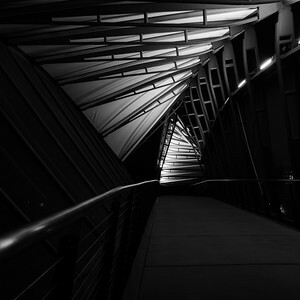 The Amgen pedestrian skybridge over the railroad tracks delivers some nice architectural meat for an interesting night shot.